Please click this link to download the chapter. The connections of West Africa with the Mediterranean world is a very old one, which long predates the rise of Islam in the late 6th century CE. Several centuries before the rise of the Roman empire, the Greek historian Herodotus (c. 484-425BCE) wrote of peoples in Africa. Herodotus wrote repeatedly of the peoples of the Nile Valley, stressing that many of them were Black Africans, and suggesting connections with people further to the west. Rock art from this period, and later, suggests the existence of wheeled chariots south of what is now the Sahara, and suggest a connection with the Mediterranean world. Zoomorphic figures. Round head period (9.500 – c. 7,000 BP). Algeria. Tassili n’Ajjer. Tan Zoumaitak. Wikipedia. Public domain. It’s important to know that the Sahara desert itself was not as harsh in these ancient times as it later became, and is today. Rock art from the Sahara desert is abundant, and some of it is as much as 12000 years old. A good example is the Tassili n’Ajjer, north of Tamanrasset in the Algerian Sahara. 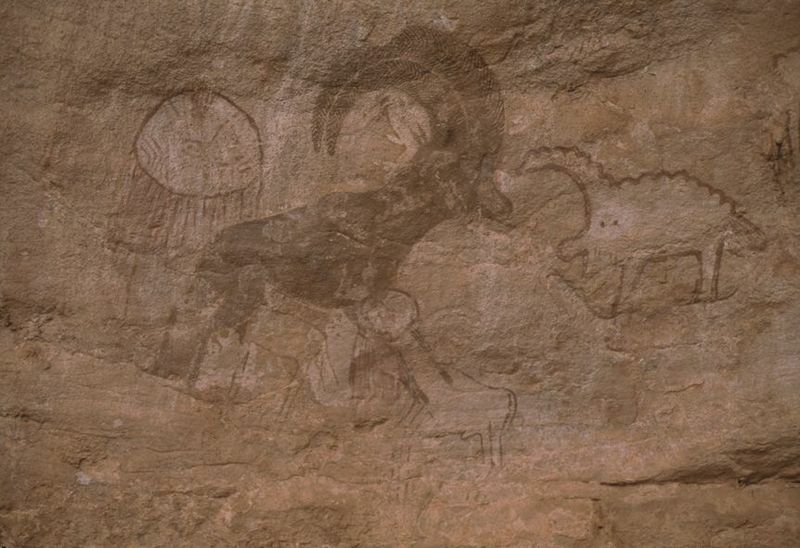 This is one of the oldest examples of rock art in the Sahara. Another good example is in the Tibesti Massif in Chad, which also has rock art dating from around this time. These old paintings show areas which are now in the desert as fertile, rich with animals which can no longer live in these desert areas, such as buffalos, elephants, rhinoceros, and hippopotamus. It’s important to bear in mind that this era of fertility in the Sahara coincided with the European Ice Age. The Ice Age was not a problem in Africa, and in fact this seems to have been a time of plenty. The Sahara appears to have begun desertifying more rapidly around 3000 years BCE, but there remained strong connections with the Mediterranean until a later point. This is shown by the Carthaginian general, Hannibal. Carthage was an empire based in Libya [the most powerful empire in the Mediterranean until the rise of Rome], and around 220 BCE Hannibal embarked on an attack on Roman forces in Europe which involved crossing the high Alps mountain range. His military supplies were carried by elephants, and these were African elephants connected to the peoples and geographies south of the Sahara. Desertification increased and the geographical boundaries became harder to cross. By the time of the rise of Islam, in the early 7th century CE [from c. 610fl., with the establishment of the early Caliphs, c. 610 CE], there were fewer connections. But the growth of powerful Islamic kingdoms in Morocco, and of centres of learning based in Cairo, Tripoli, and the Middle East, saw the rise of the caravan trade. By the 9th century CE, the empire of Ghāna [also known as Awkar] had been founded in what is now Mauritania [the first historical references coming from c. 830 CE], with the capital at Koumbi-Saleh [the trading route from Ghāna was concentrated in the Western Sahara, with its terminus at Sījīlmassa]. By the 10th century CE there were separate settlements for those practicing African religions and those practising Islam at Koumbi-Saleh, indicating the large number of North African traders who were coming. The gold trade was already spreading to influence commerce and society in the Mediterranean, and it was at around 1000 CE that West African gold was first minted for markets in Europe. It’s important to grasp how events in West Africa were connected to those in North Africa and even in Europe by the 11th century. A vital change occurred in this time, spearheaded by the Almoravid movement. They appear to have grown from Berber Muslims who migrated north from the Senegal river seeking a purer form of Islam after the middle of the 11th century. They conquered the Kingdom of Morocco, founded Marrakech in 1062, and then swept into Al-Andalus in southern Spain in the 1080s, where they defended the Caliphate of Córdoba from the reconquest led by the Christian kings of Spain. Córdoba had already splintered into many different mini states in southern Spain known as the Taifa states in the 1030s; in the 12th century these were overtaken by the Almohads, who also came from Morocco, overthrowing the Almoravids in 1147. In West Africa, the most important changes came in Ghāna. Until 1076, Muslims and worshippers of African religions had co-existed there, but in that year the Almoravids sacked the city and Ghāna fell into decline. Mali would not rise until the 13th century. Thereafter, the gold trade was the centrepiece of the trans-Saharan trade. Money was the cause of the early interest of Arabic traders in West Africa, which was indeed known to them as “the golden country”.The influence of the trans-Saharan gold trade on European societies can be seen for instance in the derivation of the Spanish word for gold coin in the 15th century, maravedí, from the Almoravid murabitūn dinar. The trade in gold saw the rise of powerful empires such as Mali, Bono-Mansu, and Songhay, the expansion of urban centres such as Kano, and the rise of powerful trading classes such as the Wangara. Arabic became increasingly influential through the spread of Islam and its use as a script for administration. By the 15th century, when the Atlantic trade would begin, the trans-Saharan trade had been flourishing for at least 5 centuries, and had already shaped the rise, fall, and consolidation of many West African states and societies. One of the major elements in the creation of trade networks is geography. Trade tends to be in products which cannot be found in one area, and which are exchanged with those which are needed in another. For example, societies living in areas with forest products can exchange them for salt from desert areas, and grain crops from savannah areas.In turn, savannah and desert peoples can acquire forest products. Thus, a vital factor in the emergence of the social fabric of West Africa was the Sahara desert. Where the geographical barriers between different climate zones are extensive, the trade networks needed to move goods have to be more complicated. In order to thrive, societies need to develop new means of accommodating stranger traders. Where the barrier is as large as the Sahara desert, or the Atlantic Ocean, the social fabric will become intertwined with these complex trading networks. This occurred in West Africa with the trans-Saharan trade; and the social frameworks which emerged with this trade then became influential in shaping the early trans-Atlantic trade. So it is hard to understand the importance of trans-Saharan trade without understanding its importance for society, in terms of organisation and belief. One important climatic factor in the shaping of West African societies was the spread of the tsetse fly. In humid forest zones, the tsetse fly which causes Sleeping Sickness meant that it was hard for pack animals to survive. Camels, horses, donkeys, and the like could not easily survive in areas where the tsetse fly could live and thrive. This meant that society had to be organised so that people would fulfill that role, and be able to carry headloads of gold, kola nuts, ivory, and more. This became significant as the trans-Saharan gold trade became ever more important from the 11th century onwards. There were two main zones for the location of gold in West Africa. One was on the Upper Senegal river, especially the tributary of the Falémé. The other was in the forests of the Gold Coast. Being close to the source of gold was of course a great political prize, and it is significant that the areas near to both the Falémé and the forests of the Gold Coast saw the rise of stable political systems for many centuries. In the Falémé, this was the kingdom of Gajaaga [known by the French as Galam], which saw stable rule for 8 centuries [according to the Senegalese historian Abdoulaye Bathily]. In the Gold Coast, this came in a series of powerful Akan states, beginning with Bono-Mansu in the 14th century, and then continuing through Denkyira and Akwamu to 1700, all of whom relied on the gold trade. In Senegambia, the Falémé source of gold was in a semi-desert area where the tsetse fly could not thrive [later this was close to the heartland of the kingdom of Bundu]. This favoured the creation of powerful cavalry forces, and so one of the main things traded by the North African traders in the trans-Saharan trade were their famous “Arab” horses. Cavalries were important to the process of state formation and military control in areas such as the Jolof empire in northern Senegambia, and in Borno and Kano further to the east. Indeed, one of the first areas of the trans-Saharan trade which Europeans copied was in the institution of a horse trade, with horses bred on the Capeverdean islands and traded to the West African coast as early as the 1470s. In Bono-Mansu, however, horses could not flourish because of the tsetse fly. This meant that the role of head-carriers was vital in ensuring the smooth operation of the gold trade. Gold was dug out of the mines in the forests a hundred miles north of the Atlantic coast, and then porteraged north to the termini of the trans-Saharan trade at Oualata [in present-day Mauritania], Timbuktu [in present-day Mali], Kano, and N’gazarzamu at Borno. These urban centres were vital to the organization of the trans-Saharan trade as a whole. They had to develop complex infrastructure of service provision for the long-distance traders.By the 15th century, each of these cities had hotels for horses and traders, clearing houses for animals to return for the long-distance trade back to the Mediterranean, and markets where the wherewithal for the trade could be bought: saddlery and other kit for camels and horses, huge stocks of grain (millet, rice, and cous) to feed the slaves and traders crossing the Sahara, skins for water, dried meat, and more. Some, such as Timbuktu, had also become centres of learning for the scholars who accompanied the caravans; for Islam was also becoming ever more closely related to the success and transformation of the trans-Saharan trade. The traders who specialised in linking up the different centres of the trans-Saharan trade were known as the Wangara. By the 15th century, the Wangara formed an important trade diaspora, stretching from The Gambia in the West to Borno in the East; they also had connections in the Mali empire, and as far south as Bono-Mansu, and some of the Akan states on the southern Atlantic coast of what is now Ghana. As we have seen, Islam had become closely connected to trans-Saharan trade: all of the traders from North Africa who came with the caravans were Muslims, and they preferred to trade with Muslims only. The rise of the Almoravid movement in the 11th century, and the fall of Ghāna, made it clear that those rulers who converted to Islam would fare better in the trans-Saharan stakes. At the same time, Islam remained the religion of the nobles and the trader class. It was not the faith of everyone, and some would resist it strongly. Thus West African rulers who wanted to succeed in the trans-Saharan trade had to develop a complex strategy. On the one hand, they had to be seen as Muslims in order to be able to entice the trans-Saharan traders: and yet at the same time, they had to be able to relate to their subjects, many of whom were not Muslims. This commercial reality contributed to what historians call “plural societies”. A plural society can be defined as one in which more than one religion is allowed and tolerated where people can mix across ethnic and religious lines, and where the ability to respect more than one faith is an important part of political and social life. This can be seen through the oral accounts of key rulers such as Sunjata Keita of Mali, many of which emphasise the place of musicians in the court of Mali. The balafon was a royal instrument, which can be seen through its relationship in oral accounts to the sorcerer-king whom Sunjata defeated, Sumanguru Kante. Sumanguru was also reputed as a “Blacksmith king”, in tune with the supernatural powers of smiths and previous political regimes. Thus even Islamic rulers such as those of Mali showed their respect of African religions [and this may also explain why political leaders from Mali explained in Cairo in the 1320s that it was not possible to convert the producers of gold to Islam]. The Wangara diaspora of traders gradually became more and more important in creating a common culture across different parts of West Africa. Their arrival in Borno by the 15th century showed how the pluralism of society, the spread of Islam as a scholarly, religious, and commercial religion, and the arrival of more and more global influences were all coming together across a wide part of West Africa. One of the impacts of the growing trans-Saharan trade was the spread of Arabic as a written language in West Africa. Arabic became not only a language of faith and religious scholarship, with the many mallams, shereefs, and other seers who came to the region. It was also a language of government and law. The many manuscripts now housed in the Ahmed Baba Institute in Timbuktu are testament to the spread of literacy in West Africa from an early time, and certainly it had become important by the 13th century. Rulers of important West African empires such as Mali and Songhay of course maintained existing indigenous frameworks of rulership. However they borrowed Islamic bureaucratic forms, religion, scholarship and legal structures to govern the new states, and the complex international relationships which they were developing through trade with the rest of the Islamic world. Taxation, law, and state offices all developed alongside the literate class which became vital to the functioning of the states of the Sahel. By the 15th and 16th centuries, certain desert clans were renowned for their learning and scholarship. In Western areas such as Mauritania, these were known as the zwāya, and in the later 17th century they would have a major role in the Islamic revival movement which spread in the 18th century.Desert clans such as the Masūfa also migrated to Timbuktu from Māsina in central Mali, bringing special areas of learning in Islamic law (fiqh).The high status of these scholars is shown by the fact that the great Timbuktu scholar Ahmad Baba had as his main shaykh or religious instructor a scholar from Djenné on the Niger. [Ahmed Baba lived from 1556 to 1627, and wrote over 40 books in his lifetime; he has the reputation of being Timbuktu’s greatest scholar]. 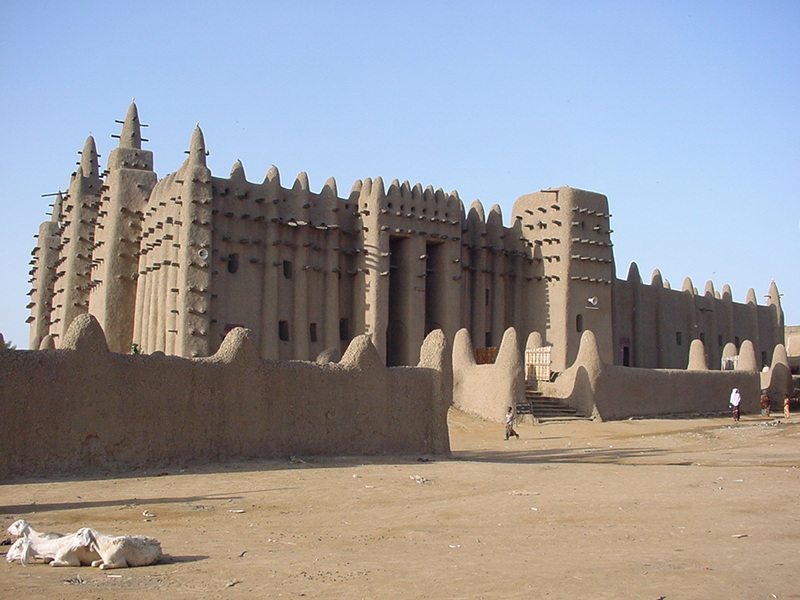 Great Mosque of Djenné, 2003. Wikicommons. The spread of Arabic has been studied by some historians through the spread of the use of Arabic on tombstones. The Brazilian historian PF de Moraes Farias spent his career studying these funerary inscriptions in cemeteries in Mauritania, Mali, and Niger. What he found was a more integrated history of Songhay, Tamasheq, Berber and Mande peoples than traditional histories had suggested. Arabic was not only an elite language of learning, but also became a language used by many to pay homage to their departed family members. 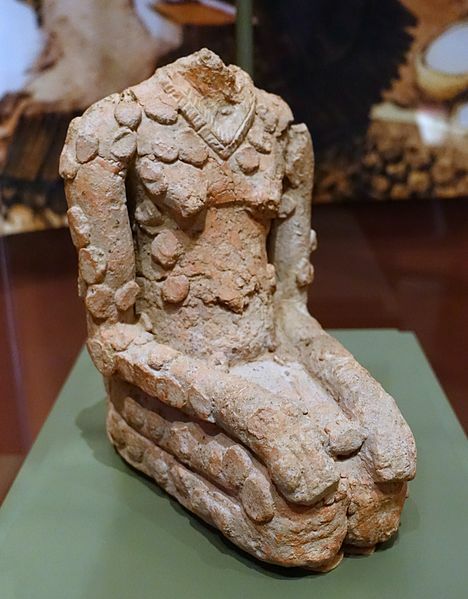 Headless figure, Jenne-jeno, Mali, 900-1400 AD, terracotta – National Museum of Natural History, United States. Wikipedia. Public domain. An important feature of this rise of Arabic was the spread of scholars from North Africa in centres of learning such as Kano and Timbuktu. Indeed, this was also an exchange, since scholars from West African cities moved to learn, study, and preach further afield. One was Al-Kānemī, from Kanem-Borno, who lived and taught in Marrakesh c. 1200, before dying in Andalusía in Spain. By the 14th century, annual caravans took pilgrims from West Africa to North Africa and then to Mecca, and there was in Cairo a hostel to accommodate only those pilgrims who came from Borno; while Askia Mohammed, who became ruler of Songhay c. 1495, instituted a garden and lodge for pilgrims from West Africa in Medina [a holy city of Islam, in Arabia], during his own hajj. 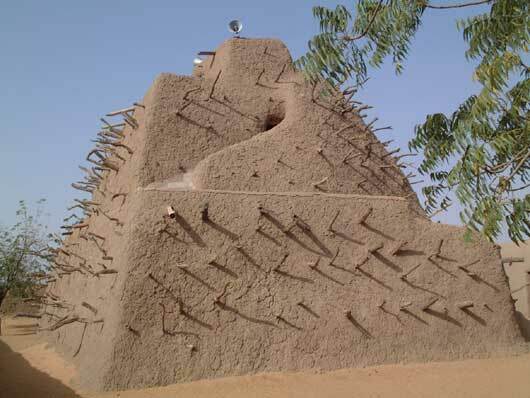 Tomb of Askia (1443 – 1538) — mud building in modern Mali. Wikipedia. Photograph by Taguelmoust, CC BY-SA 3.0. The frequency of such presences of West Africans in the wider Islamic world is shown not only through the spread of Arabic, and the number of documented journeys made, but also by oral accounts. For instance, [the Gambian theologian Lamin Sanneh notes that] one of the most important strains of Islam in this period was that of Suwerian Islam. The founder of Suwerian Islam, al-Hajj Sālim Suware, is said in oral accounts to have made the pilgrimage to Mecca seven times in the early 13th century. This is unlikely to be true, given just how difficult this journey was [and also as the Qur’an lonely requires it as a duty for Muslims to make the pilgrimage once in their lifetimes if possible]. However, the story reveals just how normal these journeys were, and how often they took place. By the 15th century, the growth of the gold trade had gone hand in hand with the emphasis on scholarship. The last 15th century Sarki of Kano, Mohammed Rimfa, invited large numbers of scholars to settle in the city, and one of them – Sherif Abdu Rahman – came from Medina. Rahman brought his own library and many learned followers. The city walls of Kano were built, and the Kurmi market established, which showed just how much urban developments, learning, and the growth of the trans-Saharan trade had become interconnected. This was also very apparent in Timbuktu. Timbuktu grew a reputation as a city of learning, and yet during the reign of Sonni Ali (c. 1464-93) of Songhay, its scholars felt undermined and slighted. After Sonni Ali’s death, many mallams from Timbuktu complained at his rulership and departure from orthodox Islam, and the ways in which they claimed he had persecuted the mallams. In the 16th century, a succession of Askias ruled who followed a more orthodox path of Islam, and the city’s reputation as a centre of learning reached its peak. But this would fall with the Moroccan invasion of Songhay in 1591 [after which time, many of its scholars would disperse west, to Mauritania; which is why many scholars of Islam in Mauritania see this as the centre of Islamic scholarship in the Sahel by the 18th and 19th centuries]. Perhaps the most famous and influential kingdom linked to the trans-Saharan trade was that of Mali. Mali was founded by Sunjata Keita in the 13th century, defeating the blacksmith king Sumanguru Kante. However, in Mali, the ruler who reached world renown at the time was the Emperor Mansa Musa. 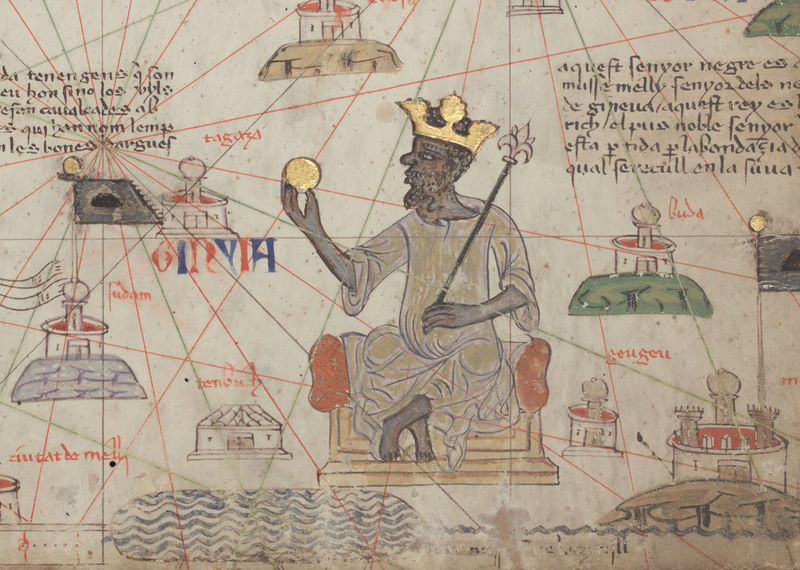 Mansa Kankan Musa Keita was the son of Mansa Aboubacarr II the Navigator who in the 1300s sent out an expedition across the Atlantic Ocean from River Gambia to discover new territories. His son Mansa Kankan Musa Keita better known as Mansa Musa ruled Mali from 1312-1337. His reign lasted barely quarter of century but the whole 1300s are still called the Century of Mansa Musa because of his lasting legacy. This legacy came out more for his exploits on his way to Mecca to perform his pilgrimage 1324-1325 than in any wars he fought and won or lost. He apparently did not want to perform the pilgrimage as he was still a nominal Muslim but when he accidentally killed his mother, he decided to perform the Hajj to purify himself and atone for his capital crime. He took along the entire court of his to Mecca including doctors, princes, griots and an army of body guard which numbered 8000 men! He left he Capital of Mali and traversed the Sahara through Walata in present day Mauretania, then Libya before entering Cairo. From Cairo he entered the Holy city of Mecca. This pilgrimage had economic, political and religious consequences. Economically, Mansa Musa dispensed so much gold on his way to Mecca that he has since then been called the richest ever human being to live on this earth. He also cemented trade ties between Mali and the Middle East and Cairo such that from 1325, caravans of over 10,000 camels traversed the Sahara into Mali at Gao and Timbuktu. Religiously, Mansa Musa and his huge entourage returned from the hajj renewed Muslims who now wanted to strengthen the religion and spread it far and wide. The Malian masses which were mostly animist then, were soon converted by the fresh pilgrims. Also, Mali opened up to more Arab scholars who were attracted by the immense wealth Mansa Musa displayed. These Arabs built fabulous mosques and courts for Mansa Musa. He also brought along great scholars who helped him establish the famous libraries in Gao, Jenne and Timbuktu. The hajj became one of the world’s greatest PR exercises! Politically, Mali became well known and Mansa Musa earned international repute. His pilgrimage put Mali firmly on the map. Indeed, before his death in 1337, Mansa Musa has expanded Mali into a sprawling empire with over 400 cities extending from the Atlantic in the West to the forest zones of the south. All the known states of the time such as Songhay,, Ghana, Galam, Tekrur formed part of Mansa Musa’s Mali. Mansa Musa indeed gave Mali her glory and Mali also gave Mansa Musa his glory! The growth of the trans-Saharan trade from the 10th to the 15th century led to profound transformations across West Africa, and this can be seen through a whole range of transformations that took place in the 15th century, from West to East and from North to South. It would be political, economic and social transformations in West Africa that would drive globalization and Europe’s role in this, not the other way around. A good example are events in Nigeria. In Borno, the growth of the gold trade from Bono-Mansu would lead to the movement of the capital away from the old centre of Kanem, further south to Gazargamo (Ngazargamu) in Borno circa 1470. In Kano, there was the establishment of a new system, the Sarauta system. Meanwhile, the 10-metre deep earthworks known as “Eredos”, built around Ijebu in Yorubaland, have recently been dated [by the archaeologist Gérard Chouin] to the period 1370-1420. In other regions similar transformations were afoot. In Mali, the Dogon people of the Bandiagara escarpment probably moved there in the 15th century. At the same time, in the 15th century, the Mossi kingdom rose in what is now Burkina Faso, linked to the profits to be made from taxing the onward gold trade.Al-Sa’dī describes Mossi attacking the town of Mâssina in this period.It was also at this time that Bono-Mansurose to prominence. Meanwhile, the key gold-trading centre of Bighu, also on the Gold Coast and which was to become very important in the 17th and 18th century, is mentioned by al-Ouazzan (as Bito) in the 1520s, suggesting that it too rose to prominence in these decades. Meanwhile, in Senegambia, the rise of the major military leader Koli Tenguela at the end of the 15th century coincided probably with an attempt to control the gold trade which came from the kingdom of Wuuli, on the north bank of the Gambia river. Tenguela, a Fula, would eventually lead an army south across the Gambia river to the Fuuta Jaalo mountains in Guinea-Conakry and establish a new polity there. This would lead in turn to the establishment of Fuuta Tooro on the Senegal river. In other words, all across West Africa, from Borno to Fuuta Tooro, political transformations were taking place well before trade with Europe had begun. West African mining technology, economic transformation, and political reorganization grew. This helped to create the framework in which European powers sought to expand their knowledge of the world, as they began to sail along the West African coast in the 15th century. The most remarkable example came in northern Nigeria. Kano grew very rapidly in the 15th century, sending out military expeditions to the south and becoming a regional hub linking trading networks from southern Nigeria to what is now Mali and beyond. [The Kano Chronicle gives some details of these changes]. In the reign of Kano’s Sarkin Dauda (c. 1421-38), we are told of the connections between Kano and the province of Nupe. The major power between Kano and Nupe was Zaria, which conquered a large area of land. The Kano Chronicle says, “at this time, Zaria, under Queen Amina, conquered all the towns as far as Kwararafa and Nupe. Every town paid tribute to her. The Sarkin Nupe sent forty eunuchs and ten thousand kolas to her…in time the whole of the products of the west were brought to Hausaland [of which Kano was the capital]”. Just as European power was beginning to expand along the West African coast in the 15th century, therefore, so the impact of the trans-Saharan trade reached its zenith. The 15th century was not just the time of European expansion, but of global expansion of networks, trade, productions, and the manifestation of this power in more complex states, in West Africa and beyond. Tekrur was another of the states which thrived largely as a result of the Trans-Saharan trade. It was founded in the 7th century, and was located in present day North-East Senegal in the valley of the Senegal River. For many years, Tekrur laid quietly as a vassal of the Ghana and Mali empires. Tekrur had largely Serahuly and Mande speaking populations, but in the 15th century, the Fula became powerful and removed the ruling Mande class and established the Janonkobe dynasty. They were led by a warrior the Senegalese historian Ousman Ba called ‘the great hero and saviour of the Peulh’ named Koli, the son of Tengella. He formed and mobilised a vast army and ravaged through Fouta Jallon, Mali and Jollof to make Tekrur the unvanquished power in the region. Koli was crowned as Satigi or emperor over the vast lands now under the control of his Fula armies. His capital was at Gode, near the present day Matam. Koli is remembered in the Fouta Toro legends as the big chief of the Fula animist aristocracy who lived on war and slavery, catching especially of the Fula and Tukulor Muslims of his empire. No doubt then in 1776, the Muslims headed by Sulayman Bal revolted against Koli’s oppression to found the Muslim state of Fouta. How did Koli benefit from the trade across the Sahara? Simply put, by trading grain in exchange for firearms. He was able to build a strong army which maintained Tekrur’s dominance for many decades. It is clear from what has been said above that the trade across the Sahara helped to build strong states and also to destroy them as weapons became readily available and the lucrative trade also generated envy and the desire to dominate. Ghana was one of the most famous and earliest of the West African empires. It existed between the 5th and 13th centuries in the modern Mali and Mauritania, and was heavily connected to the trans-Saharan trade. The Ghana empire with its capital of Kumbi Saleh in Mauritainia, is not to be confused with modern Ghana with its capital at Accra, which was named after it. The principal inhabitants of Ghana were the Serahuli, also called Soninke, who were part of the Mande-speaking people. Ghana owed her progress and prosperity and influence to the strategic role it played in the Trans-Saharan trade. British historian Kevin Shillington was categorical in this: ‘…Ghana’s position with regard to the trade…. made it grow powerful and its rulers became rich…. It seems likely that trade was a major factor in the growth of Ghana from the very beginning’. Ghana was located half way between the sources of the two Trans-Saharan trade items: salt from the desert up north and gold from Bambuk to the East. Ghana played the enviable role of middleman. The introduction of the camel as carrier of goods in the trade was a massive boost to the exchange between Ghana and the desert peoples such as the Berbers. Ghana’s glory could not be hidden simply because it was well traced and chronicled by the Arabic traders who came there. As early as the 11th century an Arab geographer called al-Bakari visited Kumbi Saleh, the capital and described the fabulous wealth he saw and the well advanced form of administration run by the Ghana ruler. He observed that Kumbi Saleh had two separate wards: the foreigners’ quarter where Arab trader resided and the main ward where the king and his people lived. The dumbstruck Arab visitor also described in glowing terms how well dressed in gold the Ghana king was, how he was able to raise an army of 200,000 men and how he allowed both Islam and animism to be practised in Kumbi Saleh. Of course, our Arab writers only met the royals, nobles and traders as they were interested only in gold. They said little about what the ordinary people did for a living; but we can glean from the writings that they fished and farmed along the banks of the River Senegal to survive. Ghana’s glory rested on trade and so did its collapse. When the Almoravids started to wage war against other Berber tribes, the trade routes to Ghana became unsafe and trade was affected. Dry weather conditions also affected Ghana’s ability to feed herself and her vast army; this seriously weakened the state. Also, by the 12th century, vassals like Mali had began to rebel to gain freedom from Ghana’s dominance. Songhay, on the other hand lasted from the 11th to 16th century. It rose to prominence as a result of the Trans-Saharan trade. As early as the 14th century Muslim traders were settled in Gao, the principal trade town of Songhay. Gao became the hub for the Trans-Saharan trade for the central and eastern Sahara. The farmers and fishermen of Songay ensured the traders were well fed. Songhay collected the bulk of her revenue from the taxes levied on trade caravans. One of the great Songhay emperors was Muhamed Ture also called Askia Muhamed who introduced Islam in to Songhay and increased the empire’s reaches. Like Mansa Musa of Mali, he made a pilgrimage to Mecca where he showed how rich and powerful his kingdom was. The Trans-Saharan trade helped to make Songhai rich and prosperous. It should be noted that the trans-Saharan trade continued to be important into the 19th and even the 20th century, as the continuing trade and human traffic shows. The desert is a geographical barrier which requires complex organisation to cross – those who crossed it laid the foundations of some of the most important states in West African history. 1062: The Almoravids from the fringes of the Senegal river valley conquer Morocco and establish Marrakech. 1070-1100: The kingdom of Kanem-Borno converts to Islam and becomes important in the trans-Saharan trade. Regular pilgrimages to Mecca via Cairo of the Borno kings begin in the 1100s.